SANTA CLARA, Calif. (Nov. 16, 2015)  The Santa Clara Vanguard Drum & Bugle Corps has been selected to participate in the 128th Tournament of Roses Parade in Pasadena, California, on January 2, 2017. The performance will mark the beginning of the 50th anniversary celebration for the legendary corps which is a six-time Drum Corps International (DCI) World Champion. "The Rose Parade will be a perfect start to our year-long celebration," corps CEO Jeff Fiedler said. "We are very honored and excited to be selected to participate in the 2017 Tournament of Roses Parade." According to a press release from the Santa Clara Vanguard (SCV) organization, the corps plans to assemble a unit of approximately 250 members for the Rose Parade appearance. Performers will represent the Vanguard, Vanguard Cadets, the SCV winter guard and winter percussion ensembles, and members of the Vanguard Alumni Corps. A DCI drum and bugle corps is a rare treat for Rose Parade viewers, because corps typically perform only during the summer months. Santa Clara Vanguard made one previous appearance in the prestigious parade (2004). Other corps to appear include the Troopers Drum & Bugle Corps of Casper, Wyoming, in 1985, and the 1st Canadian Regiment Drum & Bugle Corps (also known as the Edmonton Strutters) of Edmonton, Alberta, in 1982. Fiedler made the first public announcement about the Rose Parade invitation to city leaders at the October 27 meeting of the Santa Clara City Council. "We wanted to announce it here first," Fiedler said as he addressed the council. "We're proud to represent the City of Santa Clara." After hearty applause from council members, Mayor Jamie L. Matthews said, "We're exceptionally proud of you as well." The corps will represent the City of Santa Clara and the Silicon Valley in the world-renowned parade. The Vanguard's mission is to "be the recognized leader in music and movement education for young people in Silicon Valley." The organization holds numerous championship titles, including six Drum Corps International World Class titles; three DCI Open Class titles, most recently the 2015 championship win by the Vanguard Cadets; three Winter Guard International (WGI) Color Guard World Class titles, most recently the 2015 championship win by the Vanguard Winter Guard; and one WGI Percussion Open Class title, the 2011 championship win by the SCV Winter Percussion. 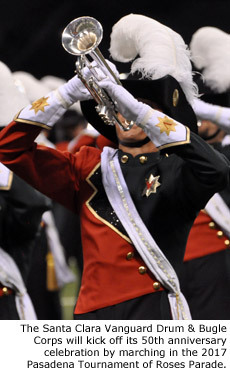 Fans can follow the corps online and through social media. 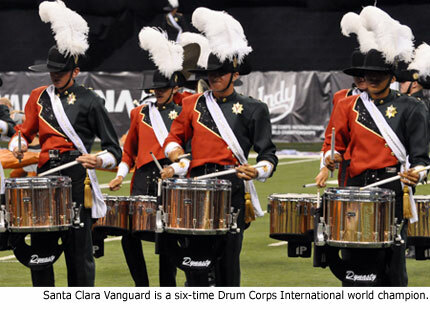 Visit SCVanguard.org or see SCV on Facebook and SCV on Twitter. Source material courtesy of Santa Clara Vanguard. Photos by Marching.com.